"Tablets? Why would I want one of those?" ...or so I'd been telling myself for sometime. Although there was always an allure to having a device for streaming media while lounging or on-the-go, I could never convince myself I actually needed to own a tablet. As a programmer, my Ubuntu desktop (as principally antiquated as it might be) covered my productivity needs at home, and when I travel, I would only occasionally touch my laptop, sticking to my phone to read e-mail and watch some YouTube. Why would I ever need another device to carry that falls somewhere between? Enter the Surface Pro 3. I had been keeping my eye on the Surface Pro lineage ever since it began, intrigued by its promise of hybrid capabilities: the concept of the tablet now seemed in reach. When I learned how the latest Surface Pro 3 had matured, and that it was capable of dual-booting Ubuntu, that sealed the deal for me. A tablet I can finally justify by its capacity for productivity. Here's how I got Ubuntu installed on my Surface Pro 3, and how you can do the same. Why Ubuntu? Why on a Microsoft Surface? I'm an open-source programmer: I spend a lot of time developing on frameworks like Ruby and Rails, for which I prefer Linux/Ubuntu. On occasion, I dive back into the .NET/Windows world, or play a game, for which I prefer Windows. I want optimal performance: Virtualizing Ubuntu on Windows 8.1 (via VMWare or Virtual Box) can be resource intensive, drain the battery, and otherwise perform sub-optimally. Running Ubuntu natively has been performant, quiet and cool; and I couldn't be happier. I want a laptop that can behave as a tablet when I need it to: After doing a lot of research, the Surface Pro 3 seemed to do fill this role the best (as a matter of personal opinion.) And so I decided I'd use Windows as "tablet-mode", and Ubuntu acts as "desktop-mode" on my Surface Pro 3. Support is only going to improve: Some of those quirks will be solved with the release of Ubuntu Touch. Others will be solved in the future Linux 3.19 kernel, meaning you won't have to compile your own drivers into the Linux kernel. It's a learning experience: There's no better way to become a master of your own domain like getting down & dirty with a bootloader. I learned a lot writing this guide, which I hope will help save lots of time for enthusiasts reading this article who'd like to dual-boot their devices. 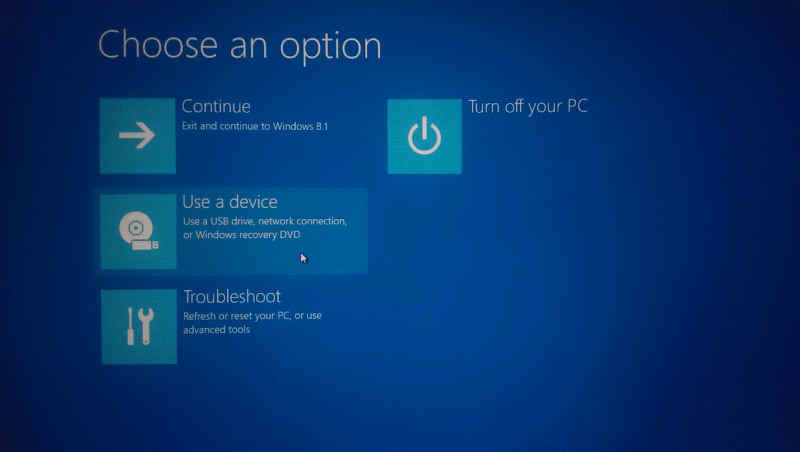 At the end of the process, your Surface Pro 3 will boot into rEFInd, with options to load Windows or Ubuntu. The WiFi, Type Cover (both keyboard and touch pad), Touch Screen, and Bluetooth should work fine. The N-Trig stylus can point, 'click' and drag, but the buttons (e.g. right-click) do not work. Volume buttons do not work. NOTE: These quirks exist for kernel 3.17.6, and may or may not exist based on your drivers/patches. It's entirely likely that the latest Linux kernel will eliminate most of these quirks as driver support is added. Despite these missing minor features in 3.19, overall, it works fairly well, especially if you dock your surface with keyboard, mouse and monitors to use it as a desktop. 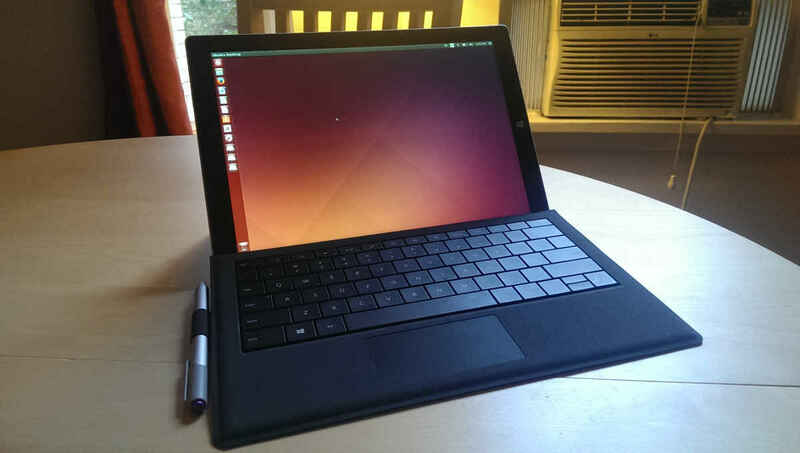 Before continuing you should be comfortable around a Linux command line, or be brave enough to try, as reconfiguring the Surface to play well with Ubuntu requires a deep-dive into the software internals of the tablet. That said, it's all much easier than it sounds, so let's get going! Surface Pro 3: I bought the Intel i7/512GB model, which came pre-loaded with Windows 8.1. USB Thumb Drive (4GB+): For the Ubuntu Installer. USB Keyboard: For typing before you finish installing drivers. USB Hub: To connect all your devices simultaneously. Charger: So the battery doesn't die. Docking Station (recommended): Provides 5 USB ports, an additional Mini DisplayPort, ethernet, and charging. Ideal for extended use of the Surface as a laptop or desktop. It's also possible to complete setup without the USB hub or docking station, but extremely frustrating. Without a doubt, it's definitely worth buying either of these before hand. I would also recommend having an extra device on-hand, like a laptop or desktop, in case you need extra firepower when downloading/compiling software, or for reference while a browser may not be accessible on the Surface. My desktop proved valuable in this role. Boot your Surface Pro into Windows and follow your usual setup routine. Create your accounts, download your apps, etc... Follow-up this by running and completing all of your Windows updates to retrieve any firmware/other essential updates. Then we need to create a partition for the new operating system, and a swap partition for paging. Open the Disk Management utility via Search. If you find that you cannot shrink sufficiently, the likely explanation is that your hard-drive is fragmented. It's a bit of a headache, but the following steps should help you defragment the SSD. Disable Windows Defender and BitLocker. These complicate defrag operations. Turn off the paging file (for now) via Control Panel --> Computer --> Performance menu. Run the Disk Cleanup utility, including the option to cleanup system files. Unfortunately the Defragmenter utility will not move system files around; we need to install a different utility to do this. Download and install PerfectDisk. Run the defragmentation operation; you should see blocks move to the front of the disk, clearing space to shrink the C: drive. 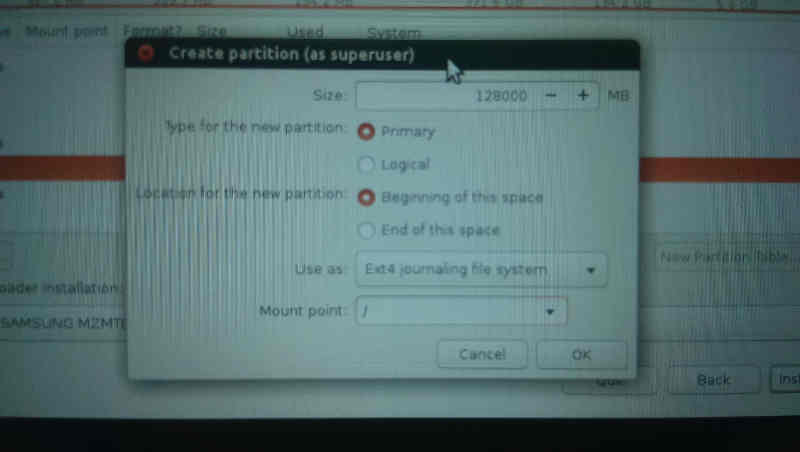 Re-use the Disk Management utility to shrink the partition. If you still cannot sufficiently shrink the partition, you might need to play around with some of the PerfectDisk defrag settings; there are likely some blocks at the end of the partition that are preventing the volume from shrinking. Power off your Surface Pro. Hold the "+" volume-key on the side of the device, then press the power button to load the EFI Boot menu. Select the Secure Boot Control option and set it to Disabled. This will permit Ubuntu to load (we'll cover this in more detail later, when I cover installing rEFInd.) Exit setup, and boot back into Windows. Grab your USB thumb drive, wipe it clean, and download the latest Ubuntu Desktop ISO from the website. At the time of this writing, I used 14.10 Utopic Unicorn, but anything 14.04 Trusty Tahr and later should work fine. 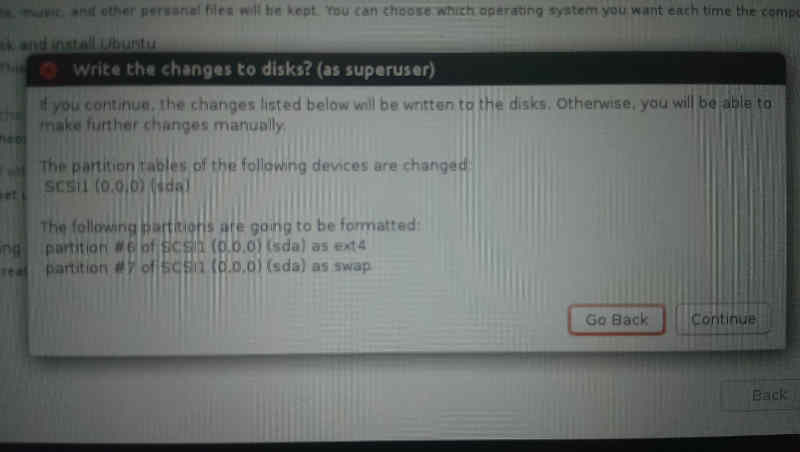 Use the ISO to create a bootable USB following the instructions here. Next, use the Search feature to open the Recovery Options menu. Select the Restart Now button at the bottom of the screen, and on the following menu choose to Boot From Device --> USB Drive, to reboot from the newly minted Ubuntu USB drive. 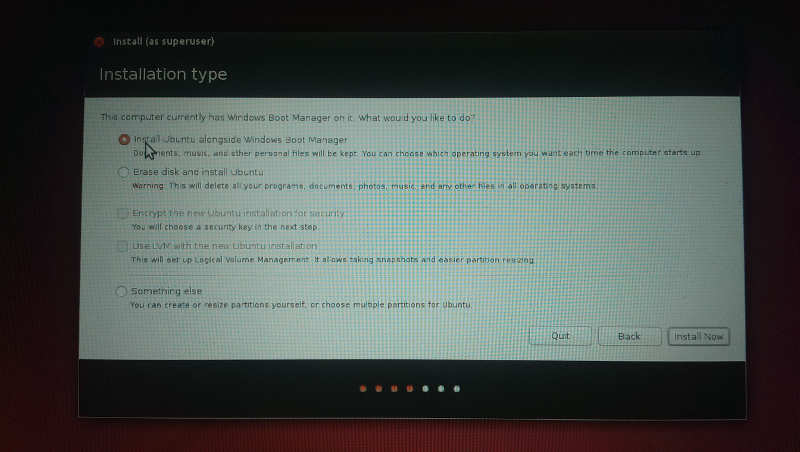 Then select the "Install Ubuntu alongside Windows Boot Manager" option, and confirm the settings in the pop-up that appears. It should automatically choose to partition the free space you created. Continue and complete setup. 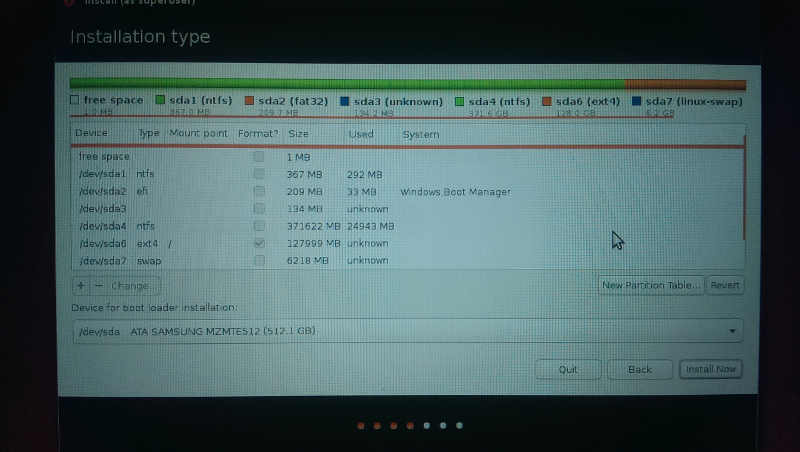 Select "Something else", in order to setup your partition. From the un-allocated space you created by shrinking the Windows partition, create a partition for the Ubuntu OS (as ext4 mounted to '/'), and optionally (but recommended), a swap partition for paging. See this post for more detail. Continue and complete the setup. If you're unlucky like me, you might not have a USB Hub, where you can have both the USB Drive and keyboard plugged in. I used the Character Map keyboard to fill in the dialogs I couldn't type on, by tapping the [EN] symbol in the upper right corner, and copy-pasting the text into the forms. Super painful and slow... be smarter than me: get a USB hub. At this point, Ubuntu should be installed and after rebooting, you should be presented with the GRUB bootloader: Load Ubuntu. Open /usr/share/X11/xorg.conf.d/10-evdev.conf with sudo privileges using your favorite text-editor. Once the Type Cover drivers are installed (in the next section), the touch pad should work after a system reboot. UPDATE: This section was necessary in the past, but no longer. You can skip this section entirely by downloading the latest Linux kernels (3.19, 4.0+) instead. You'll notice the Type Cover isn't working; unfortunately the Linux kernel at this time does not natively include the necessary drivers. The word on the street is that they'll be included in future kernel version 3.19. You can download a binary kernel built with the drivers from this repository. But if you don't trust these binaries, or want a fresher kernel version, we have to patch the Linux kernel with our own Type Cover drivers, until the official 3.19 Linux kernel is available. Download the Source Code for the latest stable Linux kernel from kernel.org, and extract the contents into a directory. Add the following contents to the that file. NOTE: this patch was generated against kernel version 3.17.6 (as based on this), and isn't guaranteed to work against different versions. Then at the makeconfig menu, press <ESC><ESC> to save and exit. Now at this point things should be looking pretty good. The WiFi and Type Cover should be working with your new kernel, and the GRUB bootloader should be appearing, allowing you to choose between Ubuntu and Windows. Even the docking station ethernet port should be humming along. If you're happy with this, you can stop here. However, there are two shortcomings that bothered me: 1) it auto-boots (after a delay) into Ubuntu when I don't have my keyboard active (a pain because I always want Windows in tablet mode, when I don't have a keyboard), 2) an ugly red boot-screen appears whenever you start the Surface Pro. Let's fix both of these. 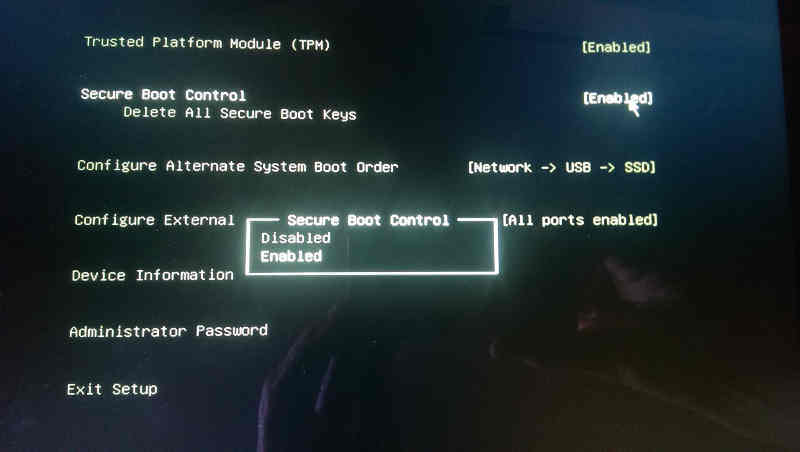 The Surface Pro 3 is a UEFI-based system (as opposed to BIOS); one of the features enabled by default is called Secured Boot. This feature is designed to prevent untrusted bootloaders (e.g. malware) from hijacking the boot-sector of the hard-drive. 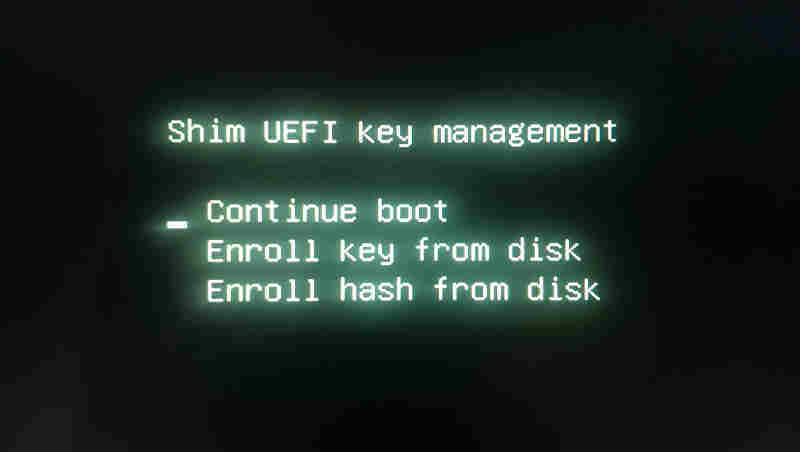 In order to install our own bootloader (rEFInd), and have it be trusted, we must follow up our install by registering a machine-owner key (MOK) with UEFI on our system. 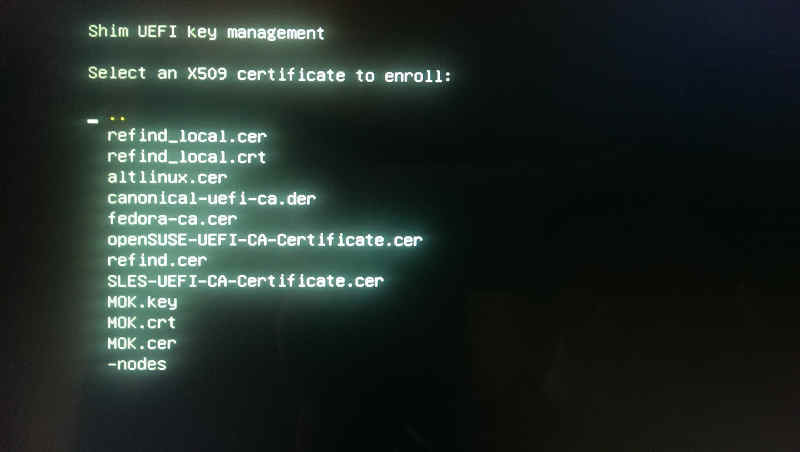 We can then use this key to sign Linux kernels as trusted, so UEFI will permit them to boot. Download the rEFInd binary ZIP package and extract the contents into a folder. 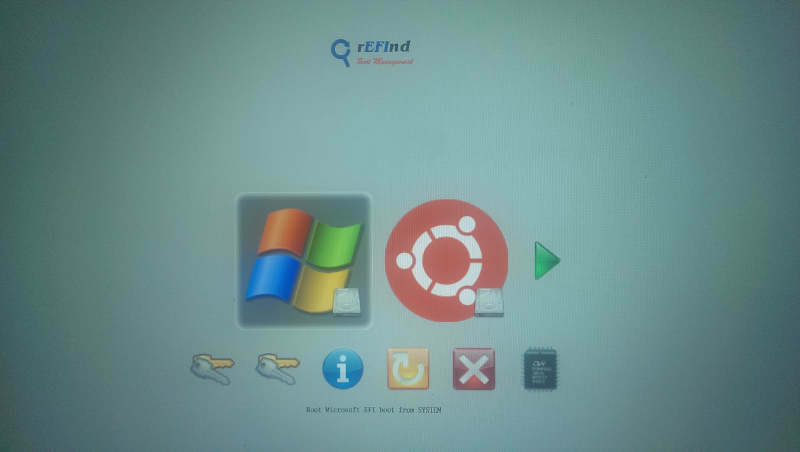 Download shim from Matthew J. Garrett's download site and extract the contents (shim.efi and MokManager.efi) into the same directory as rEFInd. When you installed using the --local-keys option, Refind generated refind_local.cer and refind_local.crt files into the /boot/efi/EFI/refind/keys/ directory. It also copied these certificates to /etc/refind.d/keys/ along side a refind_local.key file. This is your Machine Owner Key (MOK). We need to use this file to sign our Linux kernel. VERY IMPORTANT: Make a backup of the Microsoft bootloader Microsoft/Boot/bootmgfw.efi! Copy it up a directory via mv bootmgfw.efi .. Sometimes GRUB might wipe the original out when it tries to hijack the bootloader for itself. Reboot the system to load rEFInd. If rEFInd loads, you're done! Otherwise it might end up dumping you on the MokManager screen instead of into rEFInd or any other bootloader. This is the interface we'll use to register our MOK. Tap down on the menu and select register key from disk. Navigate down the ugly yellow directory structure to refind/keys, where you should find lots of *.cer files. Once you've added all of the keys, traverse back up the directory tree and select "Continue boot" at the main menu. You'll now reach the rEFInd menu, where you should see an extensive list of boot managers and kernels to load. Select the one that has your surface-pro-3.signed kernel. You can now play around with rEFInd settings to suit your tastes. I personally like setting Windows as the default with a short timeout, so I don't need my Type Cover when I want to use the Surface strictly as a tablet. Use a bootable device (e.g. USB thumb drive) to load a GRUB command line. You can reach this command line by pressing 'c' when you're on the menu of a Ubuntu USB install (where you see "Try Ubuntu without installing.") In that command line prefixed grub>, use the following commands to boot Linux manually. If you install GRUB updates via Ubuntu's apt-get update or other package management system, you might find yourself being dumped back in GRUB after a reboot. To get things back to where they were, I suggest a rEFInd reinstall. Make a backup copy of your refind.conf file, if you did any custom configuration. Delete the /boot/efi/EFI/refind/ directory and all other rEFInd files. 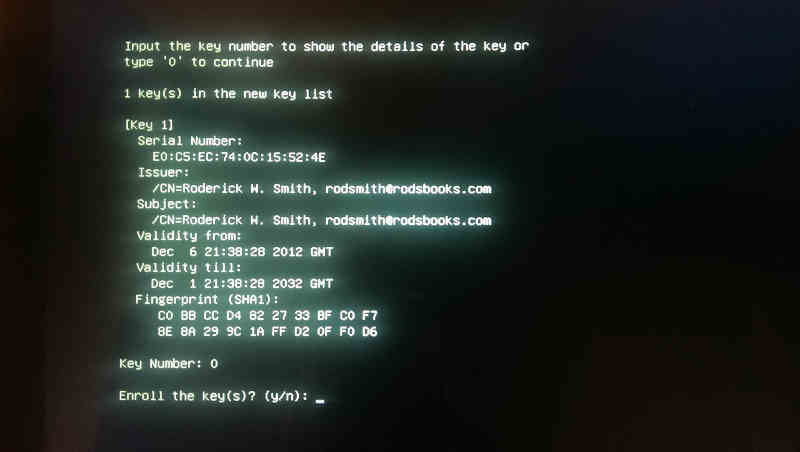 Run efibootmgr -v to see the boot order, identify the rEFInd entry, then delete it via efibootmgr -b X -B where X is the boot number of the rEFInd entry. Re-install rEFInd via the section above. If you have setup your Surface to dual boot previously using Ubuntu and Windows 8, you might be interested in taking the free upgrade to Windows 10. I personally performed the upgrade to Windows 10 using the tool Microsoft made available in Windows, and had no trouble. It did not modify my boot sector in any meaningful way, and I was able to continue dual-booting exactly as I had prior to the upgrade. To those considering the same, it should be a low-risk affair. WinAero's "How to install Linux on Surface Pro 3"
/r/SurfaceLinux, RubioJr's Surface Pro 3 thread, and the thread for this post.